Every spring for the last three years, Russia’s leading space experts have met for the InSpace Forum in Moscow to discuss how to boost the country’s space industry by facilitating cooperation between the state space corporation Roscosmos and the growing wave of private startups keen to throw their hat into the ring. 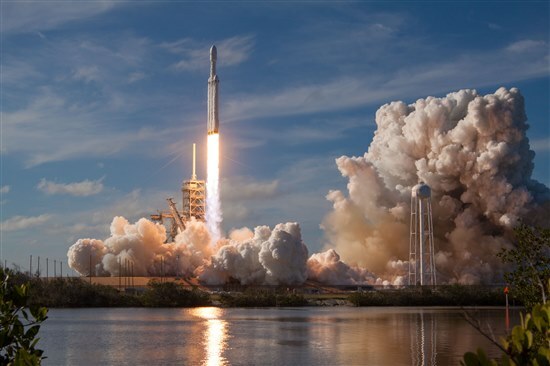 Wistful comparisons are inevitably drawn with the U.S., and these were heightened this year by SpaceX’s launch last month of the powerful Falcon Heavy rocket (and of a Tesla car, complete with a dummy of an astronaut behind the wheel). But could the U.S. model of interaction ever work in Russia? Experts are divided. SpaceX's recent Falcon Heavy demo mission is no bad thing for the Russian space industry, some analysts say. Photo: SpaceX. Roscosmos says it’s fully open to working with private space companies, and welcomes outside initiatives. “Cooperation between the private and state sector is the correct, normal and natural approach in most of the world’s economies,” Dmitry Payson, director of the research and analytical centre at Roscosmos, told the conference on Wednesday. “This is a path that’s been developed over centuries – and it didn’t begin in space,” he said. Previously, the state played the key role by setting goals, stipulating the technical specifications of each project and then commissioning contractors to fulfill them. Now there are more areas of activity and the state is not the only initiator, but that chain of action remains unchanged, he added. For some startups, that is precisely the problem. CosmoCourse, a resident of the Skolkovo Foundation’s advanced industrial and space technologies cluster, plans to launch Russia’s first space tourism service, sending adventurers on suborbital spaceflights that will enable them to spend several minutes in zero gravity. Because of the established chain outlined by Payson, the company keeps running up against bureaucratic obstacles, CosmoCourse CEO Pavel Pushkin told the conference. “Our main problem is cooperation with the state: not Roscosmos, but the state,” he said. Without a government contract, the company cannot get access to the regulations it needs to meet in order to then get a license for its activities from the relevant authorities, complained Pushkin. This does not only apply to space agencies, but also to Rostekhnadzor, Russia’s state oversight body for technical issues. CosmoCourse’s attempts to work with state space enterprises have been thwarted by their internal regulations and a lack of free capacity at those enterprises, said Pushkin. “We end up just doing everything ourselves, not because they [the state enterprises] are not capable of doing it, but because it takes too long for them to adapt their procedures, and there will be inevitably be problems and holdups along the way,” he said. His complaint was echoed by Alia Prokofieva, owner of the Galaxy group of companies. Satellite-maker Dauria Aerospace, another Skolkovo resident, became the first private company to win a state contract from Roscosmos back in 2012, to build two remote sensing nanosatellites. The satellites were launched in July last year, but – together with a group of other CubeSats launched into the same orbit – never responded to commands after the launch. Roscosmos has threatened to sue Dauria for the $5 million it had received under the contract. Earlier this month, it was reported that Astro Digital, another of the companies whose CubeSats were launched into the same orbit as Dauria’s and were lost, had received an insurance payment for its lost satellites, after Glavkosmos – the Roscosmos subsidiary responsible for launches – reportedly provided documents showing that the failure had stemmed from a launch problem, and not through any problem with the satellites themselves. “Dauria thought it would create a company and get state contracts, went on to get a state contract, and we are now raking through the consequences of that,” Dauria’s spokesperson Vitaly Egorov said during the panel discussion. Despite its protestations to the contrary, Roscosmos has no interest in giving out money and tasks it can do itself, he alleged. “What Roscosmos does wrong, in my opinion, is keeping the opportunity to make money from space to itself,” said Egorov. 3D Bioprinting Solutions, another Skolkovo resident that is due to send a 3D bioprinter up to the Russian sector of the International Space Station (ISS) to study microbe resistance and the effects of spaceflight on human cells, has had a better experience with Roscosmos, its cofounder Yousef Hesuani told the conference. The startup, a resident of Skolkovo’s biomed cluster, has found the state space corporation to be open to discussion, and after representatives of the two companies formed a working group, questions that arise are now decided promptly, and the startup has even succeeded in getting some of the regulations changed, said Hesuani. 3D Bioprinting Solutions' cofounder Yousef Hesuani pictured at last year's InSpace Forum. Photo: Sk.ru. Whatever difficulties private companies may encounter in their dealings with Roscosmos, they need the state corporation to succeed, believes Evgeny Kuznetsov, ambassador for SingularityU Moscow, a branch of a global tech community, who was moderating the panel. “We see this from the American market, where there are of course private companies, but their real success begins when they start working effectively with NASA, the defense sector and so on,” said Kuznetsov. Prokofieva said Russia should look closely at the U.S. model of interaction between state and private space companies. “In the U.S., if I’m not mistaken, more than 70 percent of the space industry is private companies. NASA acts as a regulatory body and oversees long-term projects, and all the rest is left to small companies. I’m all for that system being brought into Russia,” said Prokofieva. 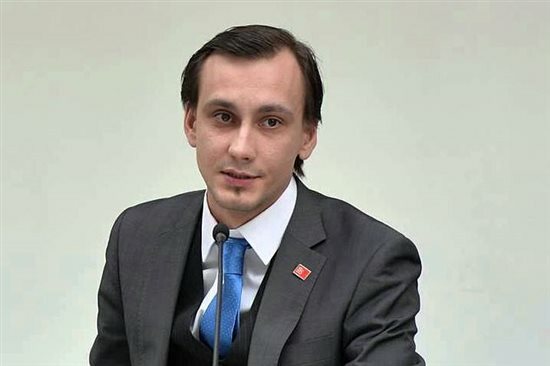 Dauria’s Egorov does not believe that is possible. 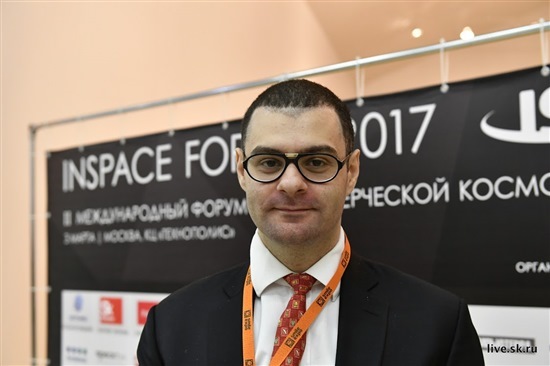 Ivan Kosenkov, a project manager at the Skolkovo Foundation's advanced industrial and space technologies cluster. Photo: Sk.ru. An important difference between the U.S. and Russian markets to take into account is that the U.S. space industry has a much longer history of private companies, says Ivan Kosenkov, a project manager within Skolkovo’s advanced industrial and space technologies cluster. “Even back in the ’50s, there were private U.S. aerospace companies like Boeing and Lockheed Martin, and it was private subcontractors who worked on the lunar modules, so despite the hype around ‘new’ space companies like SpaceX, there was already a business model for it,” Kosenkov told Sk.ru. In the Soviet Union, work on space technology was carried out exclusively by state construction bureaus coordinated by the Ministry of General Machine Building, and the current structure of Roscosmos, which took over that task at the breakup of the Soviet Union in 1991, has inherited some of that ministry’s traits, said Kosenkov. “You can’t say it’s totally wrong – it ensured a number of firsts in space – but when we’re talking about moving over to a commercial paradigm, it becomes significantly more difficult for an older structure to adapt,” he said. The Russian space industry will never be like the U.S. space industry, believes Kosenkov. “On the one hand, we should adapt the best practices that the U.S. industry has developed in private and state cooperation, and on the other, keep in mind that our institutional framework is clearly not the same as in the U.S.,” he told Sk.ru. Dauria’s Egorov says the state and private companies need to find a compromise in the form of joint investment and joint enterprises. The InSpace Forum also comprises an exhibition of space-related projects. Photo: Sk.ru. Kuznetsov identified three steps that should be taken in Russia: the creation of infrastructure to attract foreign investors (both private and state); the creation of professional negotiators and infrastructure for cooperation inside both kinds of companies, to enable the sides to understand each other and adapt their internal processes to facilitate cooperation; and making goal-setting a joint task between the state and private sector. “The main success of the U.S. market is that they have learned to develop goals together. We are trying to do that via SpaceNet [part of the National Technology Initiative], and it’s not an easy task,” said Kuznetsov. “As soon as there is an aim, a solution is found quickly, as the history of space exploration shows us. In the ’50s, solutions were found in just a few years, as the aims were clear and pragmatic,” he said. Despite the fact that many of the problems discussed at the InSpace Forum appear to change little from year to year, Kuznetsov and Kosenkov are adamant that progress is being made. Kuznetsov said that cooperation between the state and private sectors has become significantly easier in the last two to three years. Kosenkov also identified positive change, while acknowledging that change in space policy is never fast. “We are seeing some changes, like S7 Space, which emerged as a private space company last year, and has ambitions to privatise the Russian sector of the ISS, and there are examples of cooperation such as 3D Bioprinting Solutions that have been able to make significant progress,” Kosenkov told Sk.ru. Roscosmos is expected to start making its first investments in small private space projects from a corporate venture fund later this year, and Skolkovo hopes to be involved in that process, he said. “We expect our startups to go into the pipeline of the promised Roscosmos venture fund. That’s our vision,” he told Sk.ru. 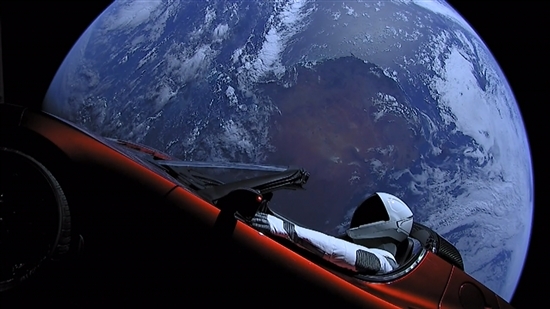 U.S. company SpaceX sent a Tesla manned by an astronaut dummy into orbit together with the Falcon Heavy. Photo: SpaceX. Meanwhile, high profile achievements by U.S. space companies are not necessarily a bad thing for Russia, believes Kosenkov. “Competition is good for the space industry: going to the moon was made possible to some extent because of the competition,” he said. Nor is Russia lagging behind in every area of space tech. 3D Bioprinting Solutions is currently neck-and-neck with its U.S. counterpart in the race to send a 3D bioprinter up to the International Space Station, said Hesuani. “The U.S. section of the ISS is supposed to get one this year, and we’re also due to send ours up to the Russian sector this year: we’ll see who gets there first,” he told the conference. Roscosmos is undoubtedly paying close attention to Elon Musk’s media campaign, said Kosenkov.